The Bonita Veterans’ Memorial is a majestic tribute to the men and women who have bravely served in the United States military. 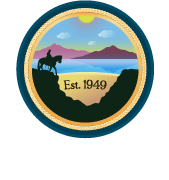 On November 12, 2005, the citizens of Bonita officially dedicated this memorial to our local heros in a ceremony featuring music and speeches of sincere gratitude and appreciation for their service. The vision for our memorial started with Commander Tom Pocklington, US Navy (retired). Tom became inspired by the idea when he attended the dedication of the Los Angeles Memorial for Veterans at the Eagle Rock Cultural Center. The Los Angeles memorial was conceived by his brother, Robert Pocklington, a veteran of World War II. Tom soon began to gather resources and contacts who could help him bring his idea to life. Tom approached the SVCA in November 2000. The organization was supportive of his vision and asked him to look into how and where a memorial could be erected. For the next four years, Tom planned and networked with the community, drumming up support and funding for the project. When the concept for the Bonita Museum was conceived in 2002, incorporating the memorial in the site plans became a priority. Many businesses and citizens stepped forward with their support. 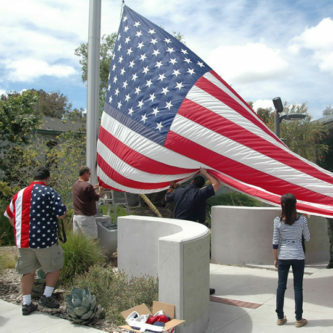 Bob and Sue Sutherland provided the funds to purchase a 50-foot flagpole, an oversized flag, and 24-hour lighting display. Supervisor Cox offered advice on how to move the project forward. When workers broke ground on the museum complex in July 2004, the memorial was part of the plan. One year and four months later, hundreds of supporters were on hand for the dedication. 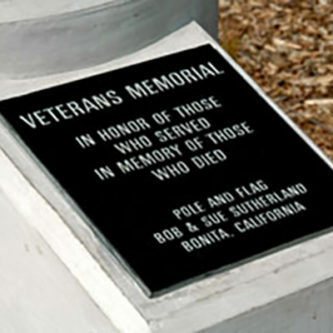 The Bonita Veterans’ Memorial is a tribute to the courage of those veterans who have given so much for our country. The flag and plaque are a visible reminder, for our community, of their sacrifice. Like all memorials, there is more to this tribute than meets the eye. Underneath the ground, at the base of the flagpole, lie packets of sand taken from Iwo Jima, site of a decisive World War II battle. Next to the sand is a prayer written to honor the sacrifices of our veterans. Together, they are a permanent reminder that a memorial is a storehouse of memories. A place to remember and share the stories of the brave men and women who have given so much of themselves for our nation.